Long recognized as a pioneer in microwave and radio frequency (RF) technology, M/A-COM has established itself as an industry leading developer and high-volume manufacturer of RF, microwave and millimeter wave semiconductors, components and technologies. Holding hundreds of patents in the field, M/A-COM has become known as expert technology innovators and integrators. Some of the major markets M/A-COM currently serves are wireless telecommunications, aerospace & defense and automotive. The PANTHER 605P provides the conventional features required for sophisticated systems: 100-channel capacity, programmable signaling options, battery status indicator, and a full range of accessories. The audio of the PANTHER 605P provides loud and clear communication, even in demanding environments. The PANTHER 605P can be customized to match system requirements. The keypad of the PANTHER 605P enables full numeric dialing, DTMF overdialling, and a choice of up to 100 wideband or narrowband channels. A user-defined keypad lock is included to guard against unauthorized use. The alphanumeric backlit display presents information on modes of operation and transmission power. Preprogrammed feature information is displayed as 2 rows of 12 characters or 1 double height row of 8 characters. A battery status indicator shows the approximate level of charge remaining in the battery. Users may choose from three battery capacities to select the battery that best suits their needs. In addition, the portable's Economy Mode helps to conserve battery life. Signaling features include European 5-tone sequential encode/decode, Channel Guard (CTCSS) encode/decode, and Digital Channel Guard encode/decode. In addition, the portable supports Type 99 decode and G-STAR signaling. Type 99 provides individual calling. G-STAR displays the unique ID number associated with each radio and in emergency mode transmits the unique ID number and the emergency signal. The PANTHER 605M was designed to meet the needs of large communications systems: 100-channel capacity, programmable signaling options, full keypad dialing, and a full range of accessories. The PANTHER 605M can be customized to match system requirements. The PANTHER 605M operates across the full frequency range of the model with no need for tuning. The mobile is available in one VHF bandsplit, from 136 to 174 MHz, and two UHF bandsplits, from 400 to 470 MHz and from 450 to 520 MHz. The optional hands-free voice-operated transmission (VOX) kit provides the versatility users need to focus on the task at hand. The sound of the radio user's voice activates the transmitter, freeing the user from microphone handling and Push-to-Talk (PTT) operation. The optional voice inversion scrambler provides call privacy. The scrambler encodes transmissions so that even if they are overheard, the voice sounds garbled. 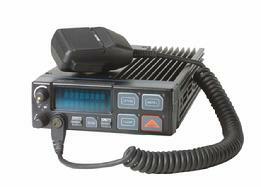 radios designed to excel in the challenging public safety environment. The M7100IP is available with M/A-COM&#146;s thirdgeneration digital voice technology, ProVoice. ProVoice utilizes the acclaimed Improved MultiBand Excitation (IMBE&#153;) vocoder. Stateof-the-art digital signal processing techniques used in ProVoice also allow the M7100IP to deliver exceptional voice quality in areas where the signal strength from the repeater is weak. The MASTR III, built on the tradition of the popular MASTR series of repeaters, is an industry leader in performance, flexibility, and reliability. The MASTR III provides innovations such as fully shielded and removable modules, front-mounted controls, and remote diagnostics. The MASTR III features the latest in digital signal processing technology, which provides a comprehensive array of control capabilities for system design flexibility. The microprocessor-controlled, PC programmable options provide flexibility, simplified setup, and easy field upgrades. The fully synthesized design of the MASTR III Base Station allows the user to make frequency changes quickly, easily, and affordably. In addition, the MASTR III operates on both wideband (25 kHz) and narrowband (12.5 kHz) channels. maintenance and servicing simple and fast. Each module furnishes easy-to-read indications of proper operation. 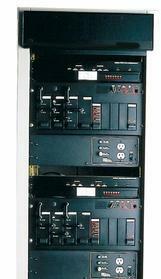 A 69-inch cabinet houses three stations or ancillary equipment. The cabinet design also increases reliability through its cooling capacity for the equipment used within it.